The realms of the north can be a cold place, wild with game, monsters and goblins. Here the green folk have their greatest numbers and the longest history of war and slaughter. The Northern realms are thus an independent, tough collection of people, stout in their beliefs and strong in their desires to protect what is theirs by birthright and might. The Northlands runs the length of the northern half of Terival, the lands north of the Dragon’s Maul and west of the goblin infested Dark North. The Northlands is composed of cold, wind swept plains and hard grass and brush and the deep, wide expanse of the great Northern woods, which covers the whole top of the area, from the sea to the Bay of the Lion’s Maul. Here men, dwarfs and hidden conclaves of elves struggle to survive not only the hard lands they call home, but also the constant threat of goblin war and monstrous beasts. Life is hard and cold in the north, but this has only made the folk of the land more determined and ready to face what life throws at them. A complete guide to the Northlands, with information on its history, people, places and culture. Also comes with several new full color maps and lots of information you wont get anywhere else. 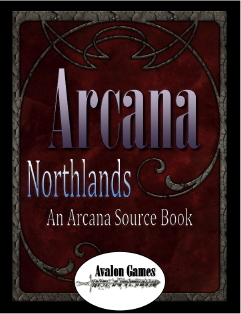 If you love Arcana, then this is a must have addition to you collection. Don’t just play at the adventure, live it with Arcana.